BLOOMINGTON, Ind. – J.K. Dobbins heard the fans chanting his name as he walked off the field after Ohio State’s 49-21 win over Indiana in its football opener on Thursday night and had a response ready for them. As they chanted “J.K Dobbins, J.K. Dobbins,” he formed his arms into the shape of an “O” over his head. “Oh, my,” might have been more appropriate. The highly rated freshman running back, who was in the starting lineup because last year’s starter, Mike Weber, was still battling a sore hamstring, was everything Ohio State fans could have hoped for. And probably even a little more than they could have asked for. Dobbins rushed for 181 yards on 29 carries in his first college game. He put a spin move on a defender that would have made NFL running backs envious. And he helped keep Ohio State in the game when Indiana took a 14-13 halftime lead after two quarters in which the rest of Ohio State’s 2017 offense often looked uncomfortably like its 2016 offense. Early on, Dobbins was about the only consistent thing in OSU’s offense. Meanwhile, Indiana quarterback Richard Lagow was throwing for 278 yards by halftime and his receivers were hauling in 12 passes of 10 yards or more in the first two quarters. Indiana still led 21-20 with just under five minutes left in the third quarter. But over the last 19:56 of the game, Ohio State outscored the Hoosiers 29-0. It started immediately after IU took its 21-20 lead on a two-yard pass from Lagow to Ian Thomas. On OSU’s first play after the kickoff, J.T. Barrett hit Parris Campbell with a short pass that he turned into a 74-yard sprint down the sideline for a touchdown and a 27-21 OSU lead. The next time Ohio State got the ball, often-injured Johnnie Dixon fielded a short pass from Barrett in the middle of the field and took it 59 yards to the end zone and the momentum shifted dramatically in OSU’s direction. Meyer said he was “not surprised at all” at what Dobbins did in his first college game. “We’ve seen that since spring practice,” he said. Weber was “about 80 percent” this week but Meyer expects him to be ready to play against Oklahoma next Saturday. “We get him back next week and that’s going to be a nice 1-2 combination,” he said. Barrett completed 20 of 35 passes for 304 yards and three touchdowns. Campbell was OSU’s top receiver with 6 catches for 136 yards. Lagow was 40 of 65 for 410 yards and three TDs for Indiana. Simmie Cobbs had 11 catches for 149 yards. Don Speck | Aim Media Midwest Ohio State running back Jordan Leasure tries to get around Indiana’s Rashard Fant during Thursday night’s game at Memorial Stadium in Bloomington, Ind. 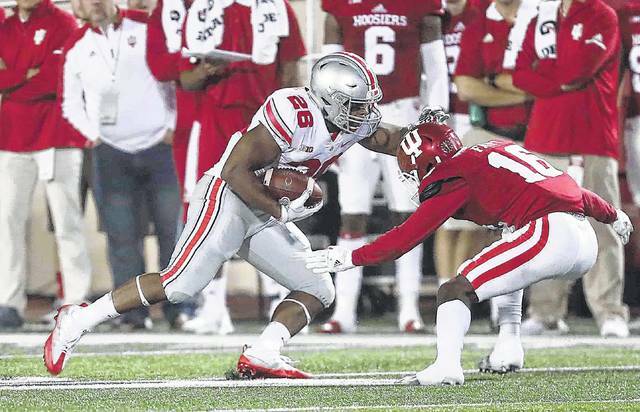 https://www.morrowcountysentinel.com/wp-content/uploads/sites/29/2017/09/web1_Ohio-State-FB-vs-Ind-DS3.jpgDon Speck | Aim Media Midwest Ohio State running back Jordan Leasure tries to get around Indiana’s Rashard Fant during Thursday night’s game at Memorial Stadium in Bloomington, Ind. Don Speck | Aim Media Midwest Ohio State’s Dre’Mont Jones stops Indiana’s Mike Majette during Thursday night’s game at Memorial Stadium in Bloomington, Ind. 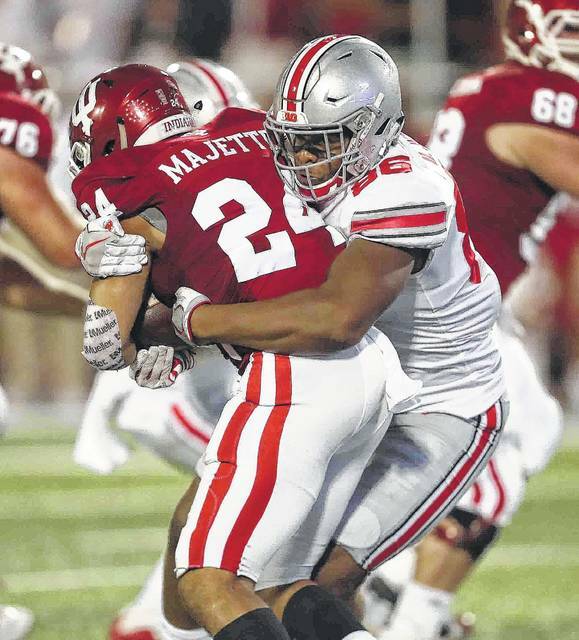 https://www.morrowcountysentinel.com/wp-content/uploads/sites/29/2017/09/web1_Ohio-State-FB-vs-Ind-DS5.jpgDon Speck | Aim Media Midwest Ohio State’s Dre’Mont Jones stops Indiana’s Mike Majette during Thursday night’s game at Memorial Stadium in Bloomington, Ind.